I previously blogged that Thai police were increasingly stopping foreigners on Sukhumvit Road in Bangkok and carrying out searches (including taking on the spot urine samples)… this is all contained in Part Two of my “Tips That You Didn’t Know for Getting the Most out of Bangkok” (link provided at the end of this blog). Since I published that blog, events have changed quite a bit… for the better. 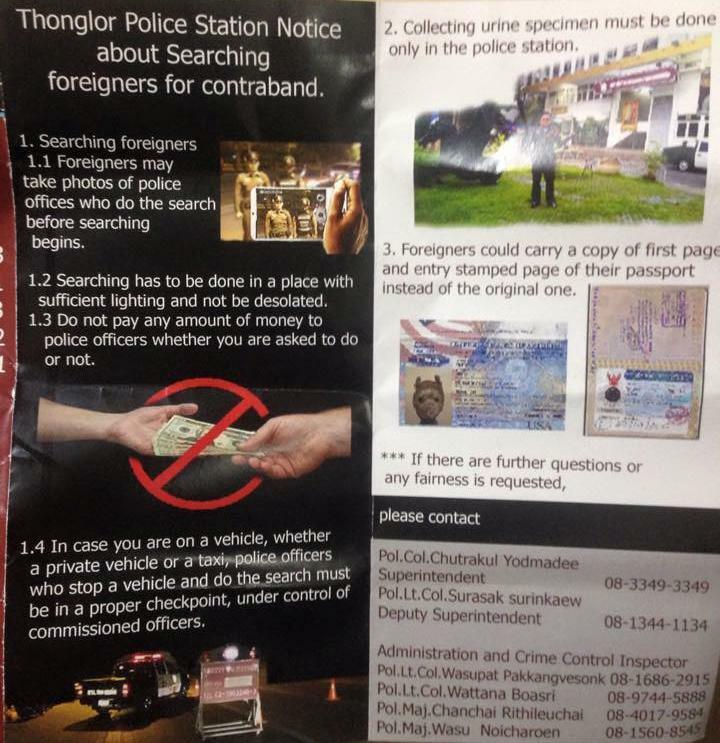 It seems that all of the negative publicity that the Thonglor police were getting for stopping and searching foreigners in the Sukhumvit area has not only resulted in the Thonglor police station releasing an information leaflet (depicted above) letting foreigners know what their rights are if they are stopped by police, but the practice of police stops by Thonglor police has almost entirely ceased. I am not aware of anyone who has been stopped since the start of the new year (at least not on the odd numbered side of Sukhumvit Road). Keep in mind that the even numbered side of Sukhumvit Road is controlled by the Lumphini police station instead, and shortly after Christmas I did hear a report about a Westerner who was stopped on Soi 4 near the Nana Hotel, and I also heard an uncomfirmed suggestion that people had been stopped and searched on Soi 12. However, even if it is still happening, it is no longer happening anywhere near the rate of previous stops. To everyone who contributed to spreading the news about this annoying and racist policy, well done! It shows that social networking sites and international media can cause the Thai authorities to make policy changes and clean up their act. Next on the agenda is to deal with the racist targeting of foreigners for littering by municipal officers… how come no Thais ever seem to be targeted? However, if you do litter when visiting someone else’s country, I do think you deserve to get fined. I just don’t like the double standards where tourists get fined but Thais can litter with impunity.